We played a Friendly match against the Club at Stoke Park on 30th April. The Club fielded an extremely strong side and we had a narrow lead at lunchtime. 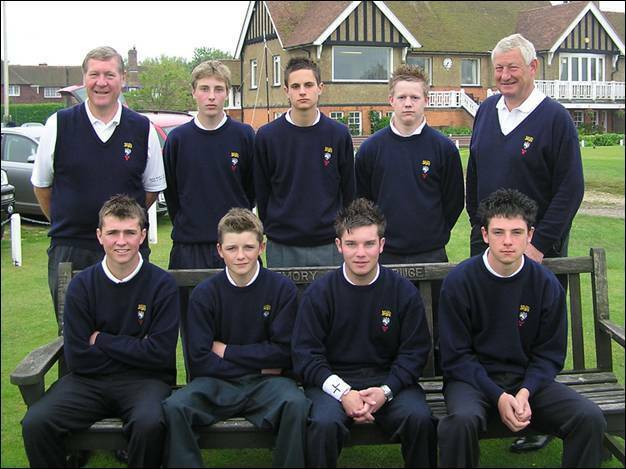 The afternoon singles were just as close and were eventually drawn to leave the County winning the match 6½-5½. 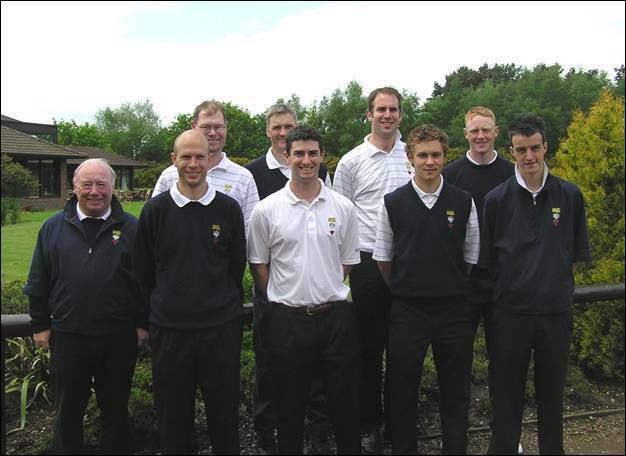 Team at Stoke Park Club: Craig Buttivant (Gerrards Cross), Steve Clarke (Buckingham), Tom Lawson (Ellesborough), Ben O’Dell (Henley), Ashley Walton (Frilford Heath), Darren Walton (Woburn), Nick Woodage (Newbury & Crookham), Adam Wootton (Oxford City). The County played a Friendly match against Dorset at Dudsbury on 30th April. The morning series of foursomes saw the game square at lunchtime but we were not prepared for what followed. The singles were completely one sided and we lost every one to lose the match 10-2. Team at Dudsbury: Alex Carey (Sand Martins), Jon Carter (Reading), Matthew Hawkes (Royal Ascot), Matthew Jones (Buckinghamshire), Tim Newton (Reading), Carl Norman (Sand Martins), Paul Raines (Buckinghamshire), Lee Wanklyn (Sand Martins). Team at East Berkshire: Craig Buttivant (Gerrards Cross), Alex Carey (Sand Martins), Ben O’Dell (Henley), Matthew Hawkes (Royal Ascot), Tim Newton (Reading), Carl Norman (Sand Martins), Paul Raines (Buckinghamshire), Lee Wanklyn (Sand Martins). 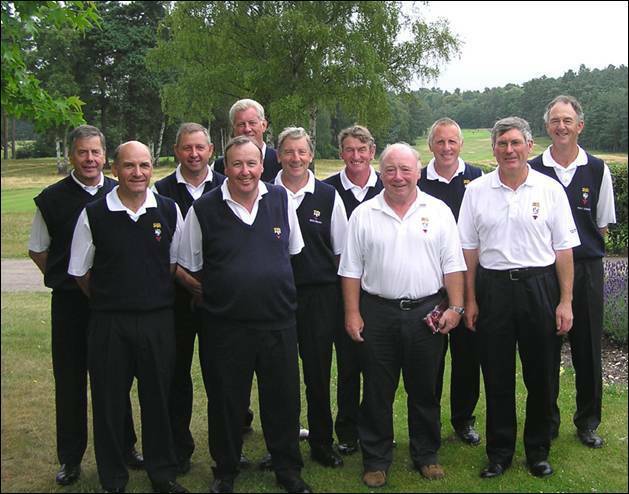 Team at Woburn: Steve Barwick (Stoke Park), Adam Birdseye (Gerrards Cross), Gregg Blainey (East Berkshire), Jon Carter (Reading), Luke Rusher (Stoke Park), Darren Walton (Woburn), Nick Woodage (Newbury & Crookham), Adam Wootton (Oxford City). A terrific performance in the singles enabled the County to secure a victory against Hertfordshire at Brookmans Park on 11th June. Despite trailing after the foursomes, which we looked like winning, a great team effort saw us only lose 1 game in the afternoon and come home comfortably by 7½-4½. 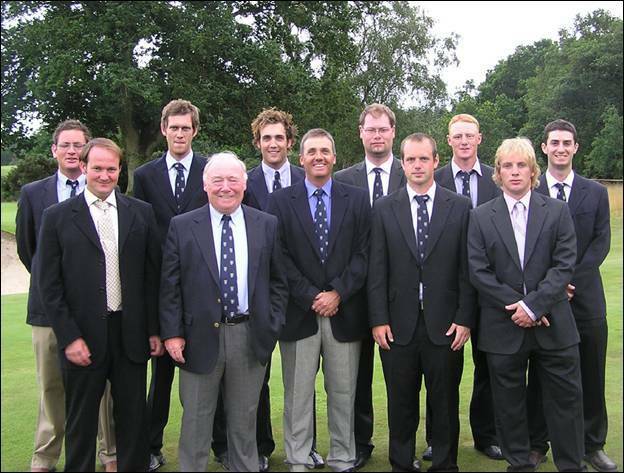 Team at Brookmans Park: Steve Barwick (Stoke Park), Matthew Briggs (Stoke Park), Jon Carter (Reading), Carl Corbin (Wokefield Park), Tom Lawson (Ellesborough), Darren Walton (Woburn), Nick Woodage (Newbury & Crookham), Adam Wootton (Oxford City). We played our third League match against Middlesex at Stoke Park on 16th July. In a close match in the morning the County side took 5 of the first 6 singles in the afternoon to secure a victory 7-5. We now play Essex on 6th August and a win or draw will secure the North of the Thames League title. 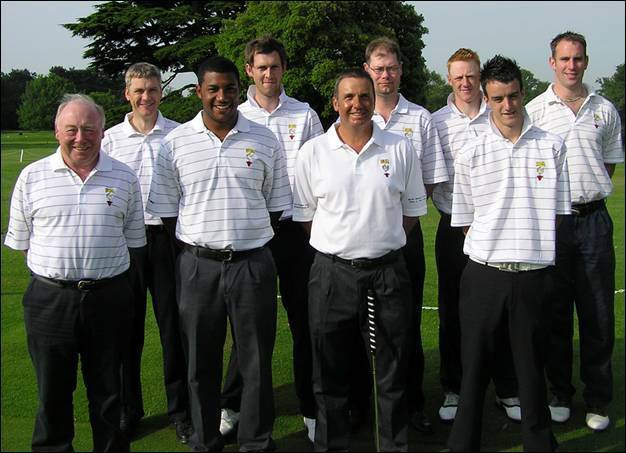 Team at Stoke Park: Steve Barwick (Stoke Park), Matthew Briggs (Stoke Park), Craig Buttivant (Gerrards Cross), Kevin Freeman (Stoke Park), Tom Lawson (Ellesborough), Ben O’Dell (Henley), Darren Walton (Woburn), Nick Woodage (Newbury & Crookham). We missed the chance to tie up the League as we went down 5-7 to Essex at Thorndon Park on 6th August. Trailing by just 1 point at lunchtime we looked secure as we went through 9 holes ahead in 6 games and down in just 2. However, Essex turned the tables on the back nine to leave us relying on other favourable results if we are to retain our League title. 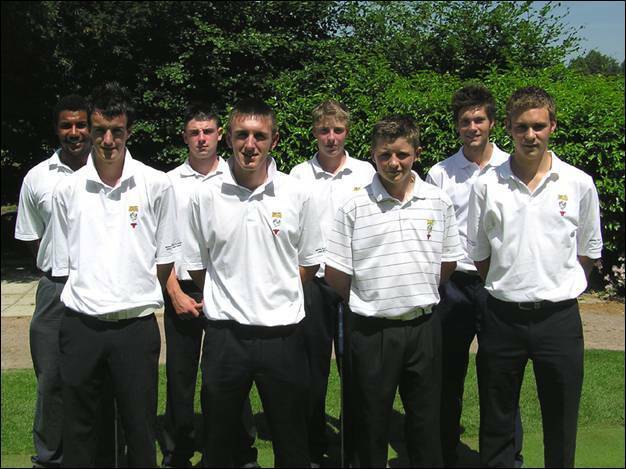 Team at Thorndon Park: Adam Birdseye (Gerrards Cross), Matthew Briggs (Stoke Park), Craig Buttivant (Gerrards Cross), Carl Corbin (Wokefield Park), Tom Lawson (Ellesborough), Ben O’Dell (Henley), Darren Walton (Woburn), Adam Wootton (Oxford City). We played our first League Match against Bedfordshire at Bedford & County on 13th May. The foursomes games were extremely one sided affairs with only one game going to the 17th hole and at lunchtime the match was all square. The afternoon singles were much closer with just one game not going to the 17th or 18th. A strong finish from Matthew Hawkes and Adam Birdseye enabled us to win the last two games and end with a drawn match 6-6. Team at Bedford & County: Adam Birdseye (Gerrards Cross), Carl Corbin (Wokefield Park), Matthew Hawkes (Royal Ascot), Josh Kensit (Richings Park), Charlie O’Brien (Woburn), Paul Raines (Buckinghamshire), Matthew Rendell (Reading), Adam Wootton (Oxford City). We played our second League Match at Pinner Hill on 4th June. We had yet another close game, with both the foursomes and singles shared in this 6-6 draw. With 2 draws from our two away fixtures we will need emphatic wins on home territory if we are to have any chance in the League. Team at Pinner Hill: Alex Carey (Sand Martins), Carl Corbin (Wokefield Park), Matthew Hawkes (Royal Ascot), Matthew Jones (Buckinghamshire), Paul Raines (Buckinghamshire), Matthew Rendell (Reading), Lee Wanklyn (Sand Martins), Adam Wootton (Oxford City). The Colts took on Hertfordshire, in a must win League match, at Henley on 1st July. We trailed after the morning foursomes by 1 point but a magnificent performance in the afternoon singles saw us take 6 games and finally the match 7½-4½. A win against Essex may well see us take the League title, but it could still go down to goal difference to decide the winners. Team at Henley: Adam Birdseye (Gerrards Cross), Carl Corbin (Wokefield Park), Matthew Hawkes (Royal Ascot), Mathew Johnson (Chipping Norton), Josh Kensit (Richings Park), Eddie Pepperell (Frilford Heath), Will Roebuck (Mentmore), Adam Wootton (Oxford City). The Under 16’s played their first match of the season at Thorney Park on 30th April. A tripartite match against Middlesex and Sussex resulted in a narrow win for Sussex. Team at Thorney Park: Sandy Bolton (Frilford Heath), Ben Cotton (The Wychwood), Liam Corrigan (Hadden Hill), Tyrrell Hatton (Harleyford), Jonathan Hewitt (Gerrards Cross), Ben Kirby (Buckingham), Steve O’Connor (Tadmarton Heath), Bradley Tailford (Hadden Hill), Andrew Tucker (Frilford Heath), Harry Whittle (Woburn). Team at The Bedford: Alex Carey (Sand Martins), Martin Dowzall (Hadden Hill), Carl Norman (Sand Martins), Josh Kensit (Richings Park), John McNally (Stoke Park), Joe Winfield (Woburn), Tom Woolley (Chipping Norton), Dean Wright (Reading). The Under 16’s played their second match of the season against Hertfordshire at Letchworth on 25th June. An exciting finish resulted in a narrow win for the home side. We led the foursomes by 3 points but our play in the afternoon was not up to the same standard and we lost the match by just 1 point. Team at Letchworth: Adam Batty (Hazlemere), Joe Blackmore (Woburn), Liam Corrigan (Hadden Hill), Robert Harrhy (Frilford Heath), Guy Hopgood (Woburn), Ben Kirby (Buckingham), Alex Land (Harleyford), Nicholas Lilley (Donnington Grove), Asa Phillips (Goring & Streatley), Bradley Tailford (Hadden Hill), Sam Whitehead (Woburn), Harry Whittle (Woburn). The Oxford Captains enjoyed their best result for a number of years as they held the Juniors to a 2½-2½ draw at North Oxford on 2nd August. 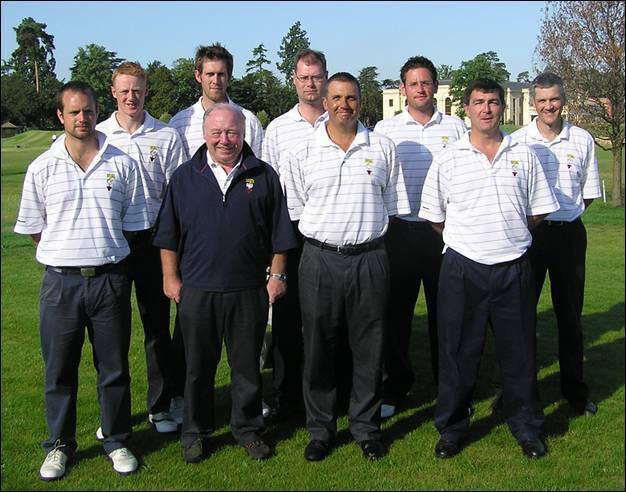 Team at North Oxford: Sandy Bolton (Frilford Heath), Martin Dowzall (Hadden Hill), Robert Hart (Castle Royle), Josh Kensit(Richings Park), John McNally (Stoke Park), Tommy Obergan (Gerrards Cross), Andrew Tucker (Frilford Heath), Joe Winfield (Woburn), Dean Wright (Reading). 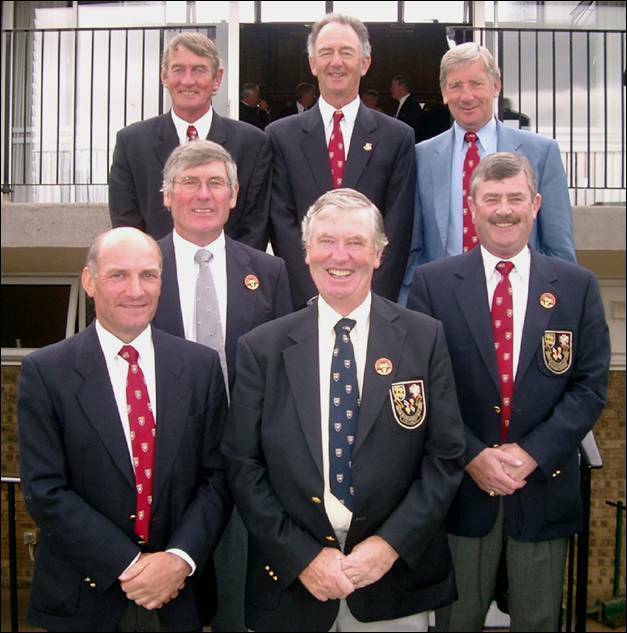 Team at The Berkshire: Jim Cameron (The Oxfordshire), Bob Clarke (Mentmore), Bryan Claringbold (Frilford Heath), Rod Crisp (Ellesborough), David Doodson (Temple), Duncan Forbes (Sonning), Robert Gill (Gerrards Cross), Anthony Parsons (Denham), John Summers (Oxford City), Jim Wilson (Frilford Heath). The Seniors bounced back from their defeat against Hertfordshire with a comfortable win by 6½-3½ against Middlesex in their second League match at Ealing on 24th July. We must win our remaining matches to stand any chance of challenging for the League title. Team at Ealing: Jim Cameron (The Oxfordshire), Bob Clarke (Mentmore), Rod Crisp (Ellesborough), Duncan Forbes (Sonning), Robert Gill (Gerrards Cross), Ian Hunter (Maidenhead), David Lane (Goring & Streatley), Gilbert Runnicles (Gerrards Cross), John Summers (Oxford City), Tommy Wells (Burnham Beeches). 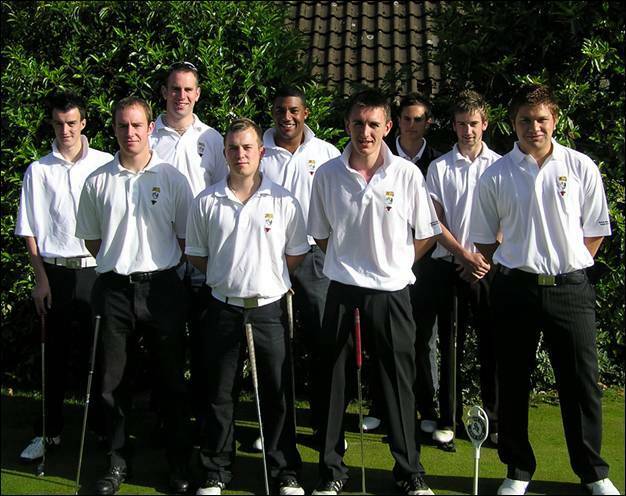 Played at Beaconsfield Golf Club on Monday 15th & Tuesday 16th May 2006. Play is split over two days and after the Monday round 20 players had broken 80 and were within 7 shots of the leader David Lane (Goring & Streatley). Most of the field appeared to be out of range of the 7 time Champion but Jim Wilson (Frilford Heath) and John Capper (The Berkshire) both with 74 were right on his heels. Nick Moore (The Berkshire) and Jim Cameron (Harleyford) were just 4 off the pace and the ‘youngest player’ - John Summers (Oxford City) was no too far away after a 77. The course was in magnificent condition, with lush rough and fast greens, with one or two tricky pin positions. The weather over the two days was showery and breezy which accounted for the CSS rising to 73 for both rounds. 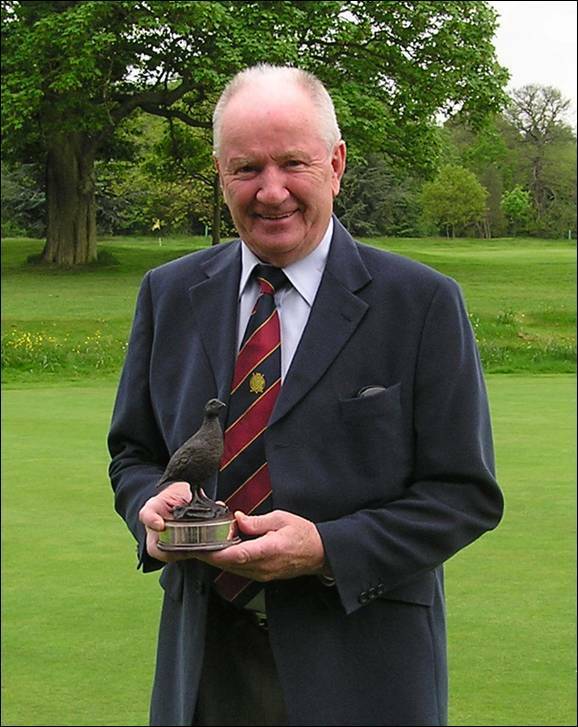 Local player David Lewis set the early pace on 154 which was soon beaten by John Capper and Derek Harrison (Maidenhead) who both carded scores of 153. There were now just two players out on the course who could give David Lane a ‘run for his money’ but he continued to accumulate par after par and enjoyed a healthy lead of 5 shots over Jim Wilson (Frilford Heath) after 12 holes but was being caught by John Summers who was playing sub par golf. With 3 holes to go Summers was within one shot of Lane but a costly three putt from Summers and a birdie at the last by Lane saw him home by 3 shots from Wilson and 4 from Summers as he claimed his 8th BB&O Seniors Title in 9 years. 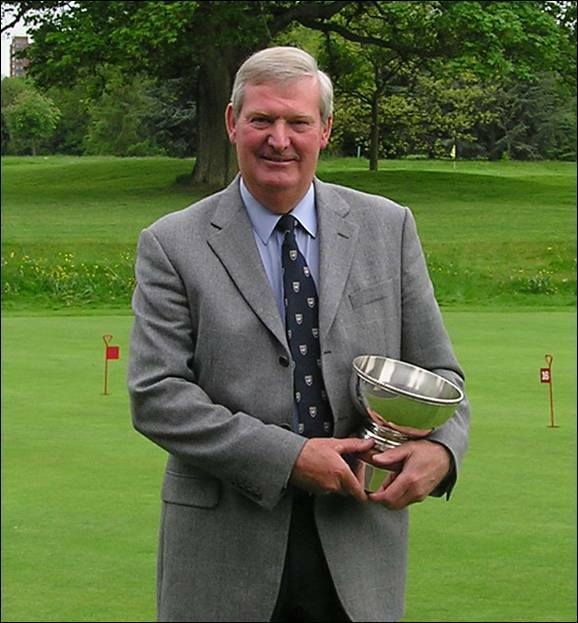 He also took the 60-64 Age Group Trophy, whilst Jim Wilson took the ‘youngsters’ Trophy. 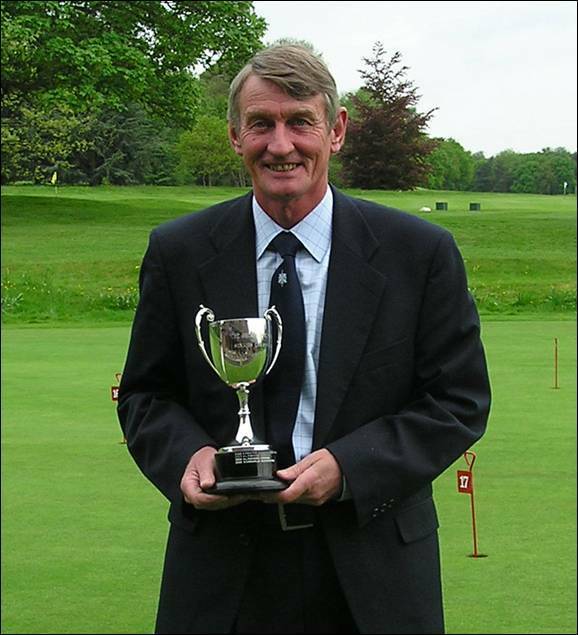 Patrick Nolan (Ellesborough) took the 65-69 Trophy and Michael Huntley (Frilford Heath) took the over 70’s Trophy. 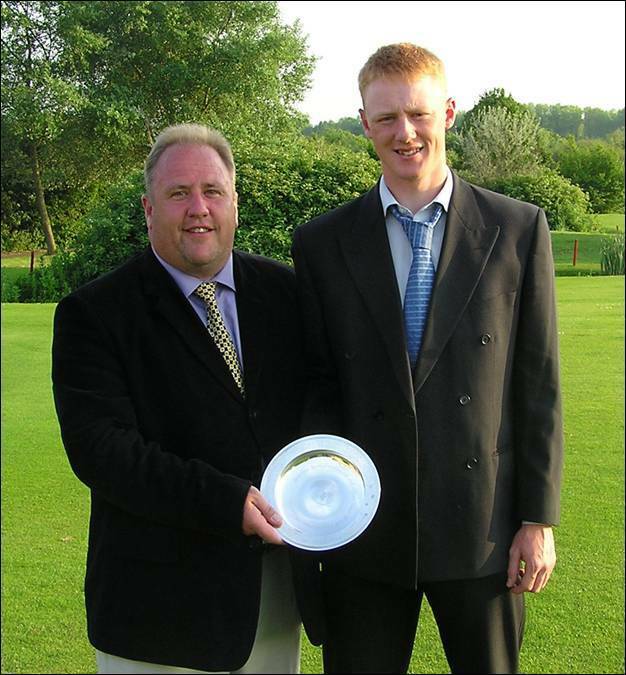 Played at Burford Golf Club on Saturday 20th May 2006. This event also serves as the qualifying round for the BB & O Amateur Championship and this year the qualifying criteria was changed. The top 48 players gain automatic entry to the Amateur and the next 60 play in the Penfold Trophy for the remaining 24 spaces. There were 121 entries and players of 1.8 and below were entered for the Amateur Championship and players of 4.9 and over were balloted out. 60 players contested the Trophy on a wonderfully prepared course despite the heavy overnight rain and at lunchtime the competition for the Amateur Championship qualifying places was quite intense. Leading the way after 18 holes were three players, defending Champion Martin Woodbridge (Frilford Heath), Alan Paterson (The Berkshire) and James Price (Buckinghamshire) all after excellent 73s in somewhat difficult weather conditions. Five other players were tied on 74 and another four on 75. With so many qualifying spaces available there was much debate as to where the cut would fall. Needless to say - The President got it right! The weather did not improve in the afternoon but the course stood up well and a number of players were content to secure their places in the Amateur by playing steadily. With most of the field in, Brandon Caddow-Young (Mill Ride) and Robert Hart (Castle Royle) led the way on 149 before Michael Forde (Calcot Park) edged ahead after two fine rounds 74 and 73. This was soon matched by Tim Newton (Reading) who had added a best of the day 71 to his morning effort. With just one group left on the course, only James Price (Buckinghamshire) could catch the leaders. Unfortunately he was not able to match the leading scores and Tim Newton took the title on countback under the rules of the competition. The qualifying score was 156 and below and all the competitors were in favour of the revised format. Played held at The Wychwood Golf Club on Tuesday 6th June. The Scratch Championship was contested by 30 teams and after the morning round there were just 2 teams within range of the leaders - Woburn Golf Club - represented by Darren Walton and Tony Crockford who had scored a fine two under par 70 despite a triple bogie on the 17th! On a lovely warm day scoring was very good and there were 11 clubs on 75 or better with Reading and Burford the closest contenders. The afternoon round saw scores come down with Beaconsfield and East Berkshire both posting excellent 70s. Tadmarton Heath added a 71 to their morning 76 and tied for the lead with East Berkshire. Woburn were level par for their round after 14 holes and had a 5 shot cushion. After a couple of minor errors they still managed to return a 75 and take the Title by 2 shots from East Berkshire. In the Handicap Championship there were 33 teams taking part and the morning scoring was not quite as good overall as those in the Scratch event, but nonetheless there were 12 teams with net 75 or better and a close finish was in prospect as the leaders from Flackwell Heath Artisans - brothers Danny & Kevin Tucker - were only 1 shot clear of the chasing pack led by Magnolia Park. An excellent afternoon net 70 from defending champions Stephen Bruton & David Gregory – Chesham & Ley Hill - gave the leaders their only serious challenge and with two birdies in the last three holes they came home by 4 clear shots to seal a memorable day in the Club’s history. Played at Ellesborough Golf Club on Friday 16th & Saturday 17th June. 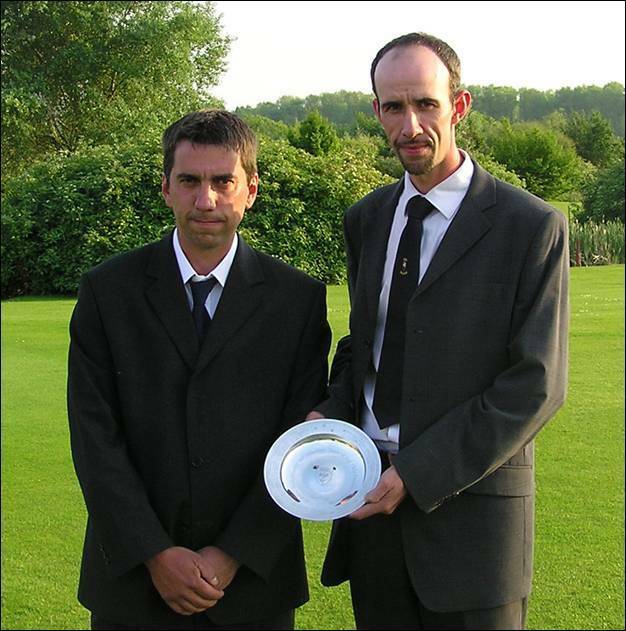 The format for this Championship changed this year and the top 48 (based on exact handicap) were entered automatically and there were 24 qualifiers from the Penfold Trophy. Disappointingly, a number of players scratched at the last minute and the final field was reduced to just 65. The field was competing for just 16 places (and ties) for the final 36 holes on Saturday and Tom Lawson was hot favourite to win around his own course and to complete a hat-trick of victories. On a lovely day with very slick greens, scoring was difficult for those without some ‘local knowledge’. Closest to Lawson’s 3 under par 68 were Ben O’Dell (Henley) with 70, followed closely by Simon Maynard (East Berkshire) and Mathew Johnson (Chipping Norton) both on level par 71. The most popular score of the morning seemed to be 73 and there were 9 others tied in 5th place. The afternoon scoring proved as hot as the weather. Matt Briggs (Stoke Park) had a fine 68, Gregg Blainey (East Berkshire) a 69, Simon Maynard had another 71 and Craig Buttivant added a 70 to his opening 73. Anyone thinking they may have picked up a shot or two was disappointed as Lawson reached 7 under par after another great round of golf. His 6 shot lead going into the second day saw the bookies close the betting! Matt Briggs had other ideas. He closed the gap with a 5 under par 66 and reduced the deficit to just 4 shots after Lawson carded another impressive 68. Still the Championship looked safe in the defending Champion’s hands as we went into the final round. It was now a two horse race and as Lawson struggled on the front 9, Briggs drew level overall after turning in 1 under par. The back 9 produce some quality golf with the advantage always with Lawson until he missed a short putt at the 16th. He then hit a fantastic second to the 17th to re-establish a one shot lead but Briggs produced an equally great birdie at the last to tie the Championship after 72 holes. A three hole play-off ensued and Lawson kept up his good work to score a par and 2 birdies to deny Briggs his first Championship. 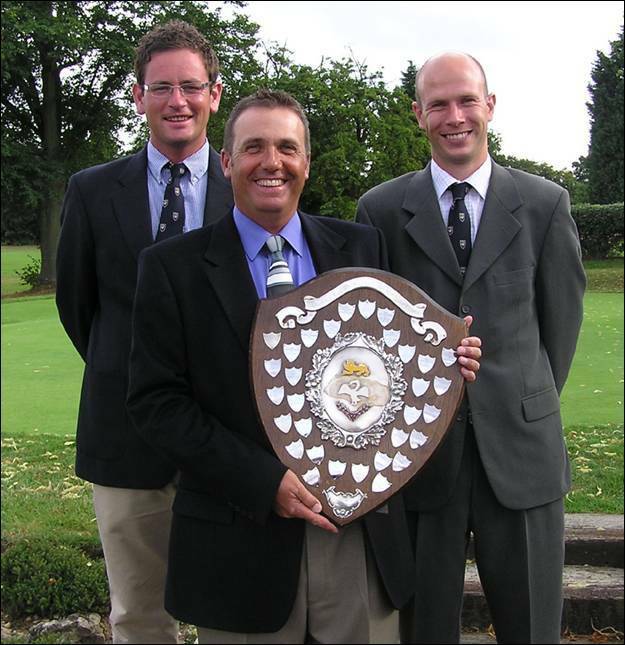 A great tournament, played in great spirit, was a fitting tribute to celebrate Ellesborough Golf Club’s Centenary year. Played at Flackwell Heath Golf Club on Saturday 29th July. The event is contested by the top 12 Clubs qualifying through the June Medal round played at their home course. This final format is the best two medal scores from three counting both morning and afternoon. The leading Club goes on to represent BB & O in the English Champion Club Tournament being held at Stoke Park Club on 15th & 16th September. 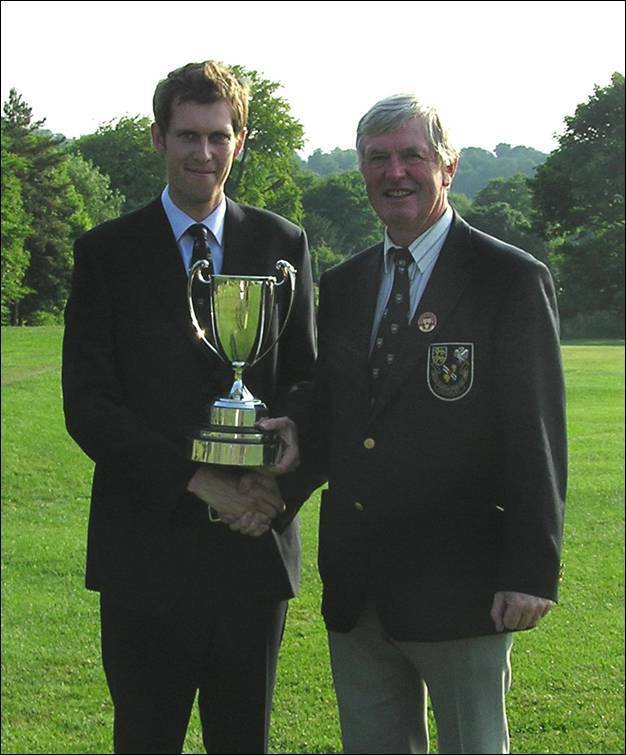 This event ran concurrently with the Courage Trophy for 2005 Club Champions and some players were in both competitions. The morning finished with just three clubs in the running, Sonning were lying third at 3 over par but trailed Beaconsfield and Stoke Park by 4 shots. The best round of the morning had been the 4 under par round of 67 from Matthew Briggs (Stoke Park), closely followed by Georg Schultes (Beaconsfield) with a fine 69. Stoke Park were determined to win this Championship given the English Golf Union final would be held at their own course in September. They played exceptionally well in the afternoon to pull away from Beaconsfield and came in with a 6 under par score to finish the day 7 under overall. Matthew Briggs scoring another 67 and Kevin Freeman chipped in with a 2 under par 69. 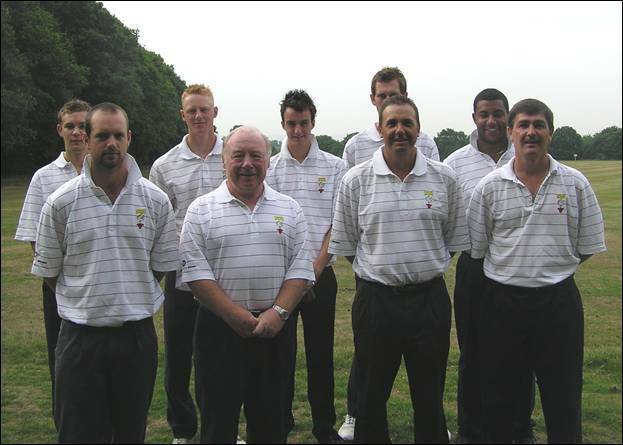 Beaconsfield were worthy runners-up at 1 under par, a score that would have won on any number of previous occasions. We wish Stoke Park luck in their attempt to become English Champion Club later in the year and hope they can carry on the good work in the pursuit of the European Champion Club title. Played at Flackwell Heath Golf Club on Saturday 29th July. This event is for Club Champions from 2005 and for the second time it had been combined with the Champion Club Finals to ensure a good field. However a large proportion of the entrants pulled out during the previous week and just 16 players contested the event - a very disappointing situation and one that will be reviewed after the playing season. In ideal conditions the morning scoring was not as expected with just Tim Eyres (West Berkshire) matching par. Ben O’Dell (Henley) was a couple of shots back with four others a further shot adrift. The afternoon scoring was a revelation as Ben O’Dell set the pace at 144 - just 2 over par - and looked certain to be challenging for the Title. Within minutes Chris Rose (Brailes) had overtaken Ben with a 2 under 69 but before the ink was dry on the score sheet David Summers (Oxford City) was 3 clear after a superb 5 under par 66. More excitement was to follow as Tim Eyres, in the last group on the course, reached the turn in 3 under par and was 1 shot ahead. Within three holes, after a couple of mistakes, he was one behind but then rallied as he produced a par, an eagle and 2 birdies in the next 4 holes to regain the lead which enabled him to par in and match David’s 66 to take the Title by 3 shots at 5 under par. 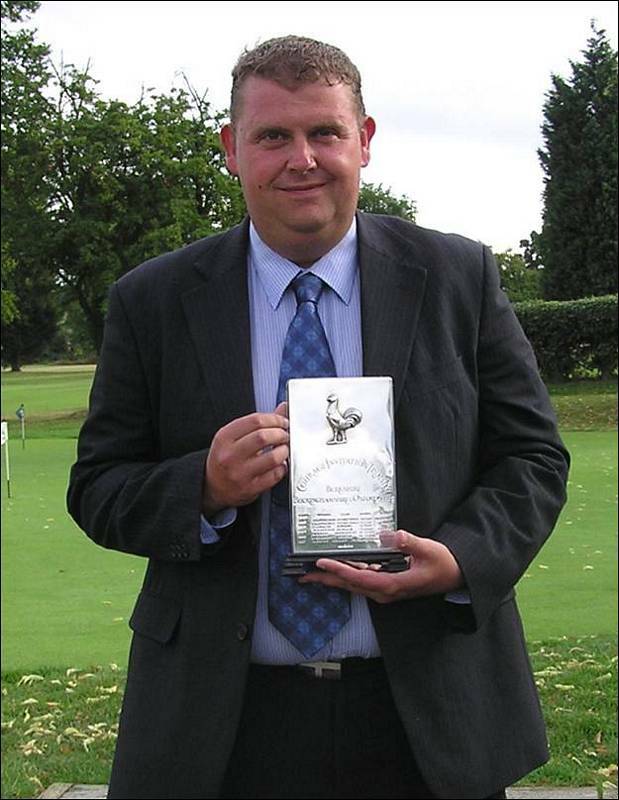 Local player Ian Jackson also had an excellent day as he took the Handicap prize with his score of 141. Played at Harewood Downs Golf Club on Thursday 3rd August. This Open event is contested by players aged 15 years and under from all over the Country. This is the fourteenth time the event has been held and the second time as an Under 15 event. It attracted nearly 100 entries and the final field was of an extremely high quality from 51 different clubs, ranging from Royal Liverpool to Royal Cromer. England Boys selectors were on hand to witness golf of high calibre, in testing conditions over the tight par 69 course, which made par or better and exceptional score. Sam Robertshawe (Army) led after the first round with a fine 2 under par 67. His score left him an impressive 4 shots clear of his nearest challengers who had struggled with the conditions. 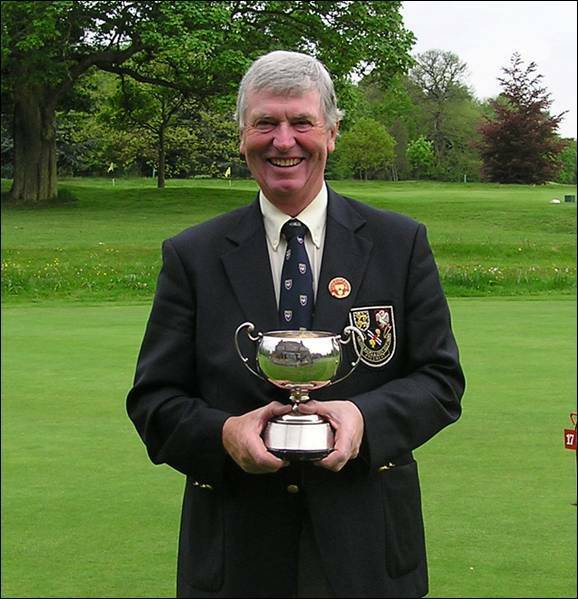 Neil Addington (Saunton) was second after a very commendable 71. Gurdit Dhanjal (Woodcote Park) and Chris Whelehan (West Berkshire) were next best on 73. The favourites were not far behind and a exciting afternoon was in prospect. 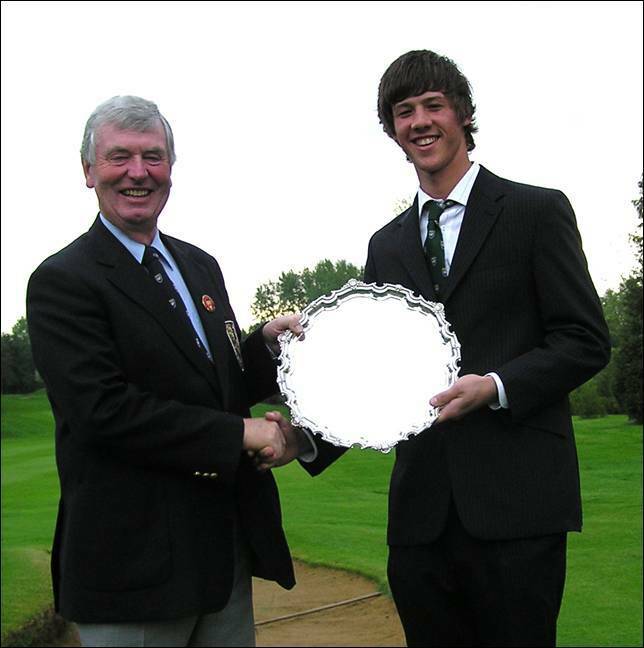 Scoring was easier in the afternoon as the weather improved and Eddie Pepperell (Frilford Heath), recently awarded and England Boys Cap at just 15 years of age, set the early pace after his 71. His score would not stand for long as both Jonathan Bell (Royal Blackheath) and Nick Davis (Hillingdon) pipped him by one. Everyone was expecting the morning leader to be in contention but unfortunately he had fallen off the pace and soon Gurdit Dhanjal (Woodcote Park) had taken the lead after another solid 72. Out on the course and going well was the winner of the English Golf Union Under 16 Championship - 13 year old Oscar Sharpe (Minchinhampton), now playing off scratch after his recent win. Level par going out, he was very much in the chase for the title and two birdies at his 13th and 14th holes saw him take the lead. A dropped shot at the tough 7th on the back nine was his only mistake and he capped a fine win with a birdie at the last to add another Trophy to his impressive CV. 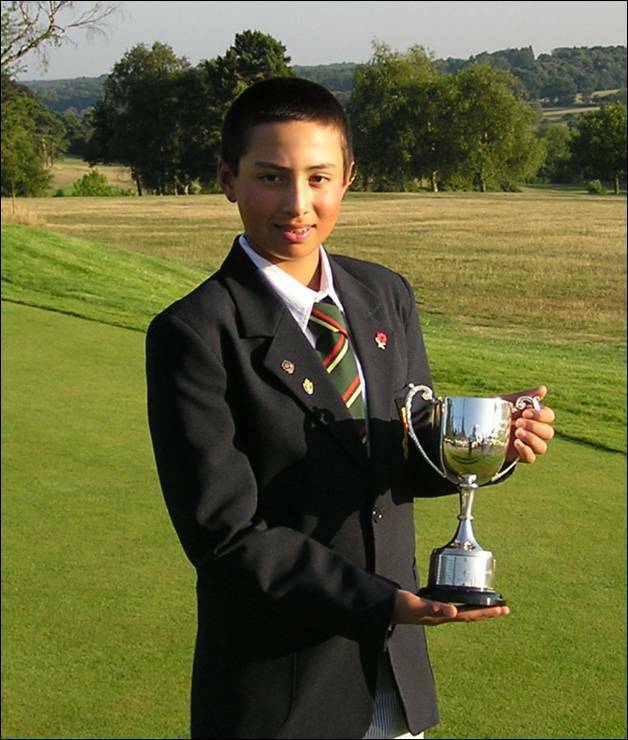 At 13 he is the youngest winner of the Douglas Johns Trophy and we hope he will be able to defend his title next year unless called up for England duties. 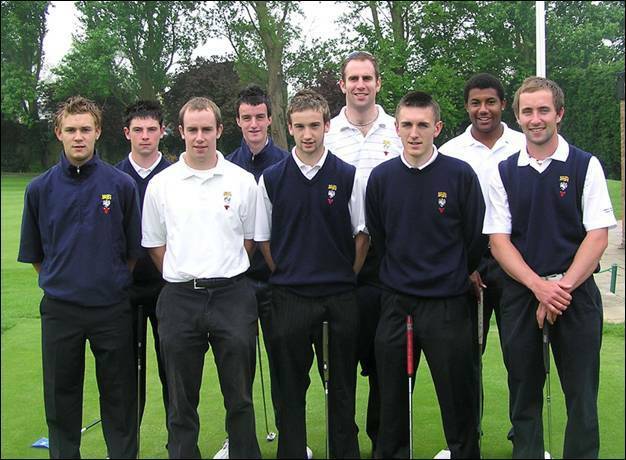 Played at Littlestone Golf Club on Friday 2nd June 2006 our Team of 6 players were: Josh Kensit (Richings Park), Tony Mitchell (Gerrards Cross), Eddie Pepperell (Frilford Heath), Mathew Johnson (Chipping Norton), James Weight (Woburn), Joe Winfield (Woburn). The format is 5 scores from 6 count from each round. Competition Scratch Score was 73 both morning and afternoon. Our players were lying 9th, a very disappointing 11 shots off the pace after the morning round, with the best score coming from Tony Mitchell (Gerrards Cross) with a 73. The whole field was tightly bunched and we had high hopes of a good finish and to improve our overall position. Just Eddie Pepperell (Frilford Heath) played well and we were unable to make any progress leaving Surrey beating Essex into 2nd place with a clear 11 shot advantage. Our total of 765 left us in 9th position. Played at Woodbridge Golf Club on Tuesday 27th June our Team of 6 players were: Rod Crisp (Ellesborough), David Doodson (Temple), Robert Gill (Gerrards Cross), David Lane (Goring & Streatley), John Summers (Oxford City), Jim Wilson (Frilford Heath). The format is 5 scores from 6 to count with just 18 holes being played. With our early scores we looked as if we could give Kent a run for the title. With Jim Wilson suffering a back injury after 12 holes and some bad luck for Rod Crisp we just couldn’t quite catch the defending champions. Yet again the best of the day round came from David Lane and our latest ‘youngster’ David Summers finished 3rd overall after his excellent 72. Played at Hankley Common Golf Club on Saturday 8th July Our Team of 6 players were Gregg Blainey (East Berkshire), Matthew Briggs (Stoke Park), Kevin Freeman (Stoke Park), Tom Lawson (Ellesborough), Ben O’Dell (Henley) and Stephen Lewton (Woburn). The format is for all 6 scores to count from each round. The standard was extremely high this year with 59 players with a scratch handicap or better. The Surrey Team were once again the strongest team on paper with a combined handicap of Plus 18 and with Kent at Plus 14 and Essex at Plus 12 this would be a tough competition. Competition Scratch Score was 73 Both morning and afternoon. Our play in the morning was steady and we lay 3rd after the morning round, 2 shots behind Surrey and 10 behind Kent. With 9 holes to go this was still the position but in an amazing turnaround both the BB&O and Surrey teams picked up birdies as Kent dropped shots. With two holes to go we were level with Surrey and would win on countback if the scores were tied. Disappointingly we could not match the Surrey birdie at the 18th and were just pipped at the post. A great team effort nonetheless.